As the MBA application season nears its end, candidates find themselves in one of two positions. Either they were successful in their efforts and must now choose where (or whether) to enroll, or they are left wondering why they were not offered admission to their target program(s). To help those applicants who find themselves in the latter category, we will pinpoint some of the areas where many unsuccessful applicants tend to have fallen short. In evaluating applications, a business school wants to know not only that you are right for its program but also that it is truly right for you! For the admissions committee to feel confident on these points, you must demonstrate clearly that you have done your research on the school and have identified specific resources, offerings, and characteristics that connect with you personally and address your particular needs and goals. Without realizing it, many candidates offer very trite and clichéd reasons for wanting to attend their target school(s), but pandering or generalizing will do nothing to advance your candidacy. Simply writing something like “[School name] offers a renowned marketing program and a strong team environment” or “I am excited about learning from [school name’s] world-class professors” is not sufficient. Your rationale for wanting to attend a certain MBA program must be truly compelling and apparent, or the school will likely choose another candidate who exhibits a greater level of passion for and connection with its program. In this age of electronic resources and readily available information, a candidate could easily do hours and hours of research on an MBA program without ever leaving their home or speaking directly to another person. As convenient as this reality may be, it is not a good formula for convincing a program that your interest in attending it is deep-rooted and genuine. We feel strongly that unless serious impediments to doing so exist, a candidate should always visit his/her target school. Not only is doing so helpful when the time comes to write essays and interview—given that you will have a much more thorough and personal understanding of the school and its community and therefore be better able to discuss your interest in it—but it also places you in a good light in the eyes of the admissions committee. However, if an in-person visit is just not feasible for you, find other ways of connecting with students and alumni—social media, direct email, phone calls, coffee dates, etc. An MBA program will never reject a worthy applicant simply for not having visited campus or connected with students or alumni, but these actions do reflect positively on the candidate. If a school is deciding between two similarly qualified applicants, and only one of the two has put forth the extra effort to travel to campus or to reach out to members of the school’s community, which one do you think has a better chance of ultimately securing a place in the program’s next incoming class? To effectively convince an admissions committee that you fully comprehend the path you have set for yourself and feel confident that with your MBA, you will be appropriately skilled and positioned to attain your stated goals, you must go beyond merely presenting the basics. You must demonstrate an understanding of the demands and responsibilities of your future position and show a clear connection between your existing skills and experience, those you expect to acquire at business school, and your professional aspirations. Exhibiting a genuine enthusiasm for the goals you present is another key part of the puzzle. You want to ensure that the admissions committee can be confident that you know what you want, that you understand what is required to achieve it, that you recognize the qualities and capabilities you already have that will help you succeed, that you have identified the ways an MBA will provide any additional necessary qualifications, and finally, that you are excited about what lies ahead. Your application as a whole is a collection of opportunities and venues through which to convey your personality, abilities, and experiences to a school’s admissions committee, so you want to be sure your focus is not too narrow. You should avoid repeating information, if possible, and find a way to share all your strongest and most compelling facts and stories. Many candidates unwittingly offer a very narrow view of themselves. Reread your application and ask yourself, “Did I share something new about myself in each essay? Did I discuss things that were not already covered in my resume, recommendations, and short answers?” Although offering two stories from the same sphere (e.g., from your professional life) is not unacceptable or inherently problematic, you must ensure that each story reveals something different about your candidacy. For example, in one essay, you could discuss your role as the team leader for a major project, and in another, you could share your experience as an individual mentor to a struggling coworker. Even though both are “work” stories, each one offers a novel perspective on you. Ideally, you would be able to draw from multiple areas of your life—professional, personal, community, athletic, international, entrepreneurial, etc.—when selecting standout stories, but if your candidacy lacks a high level of variety, you can still creatively diversify your profile by framing your narratives in different ways, from various angles. One of the few hard-and-fast truths about the MBA admissions process is that the admissions committees expect applicants to submit at least one recommendation from a current supervisor (and if not, to offer a explicit and justifiable reason why—via an optional essay). If you were unable to procure a recommendation from your current manager and failed to explain why, or if you chose another individual as your recommender instead because you believed he/she has a “better” or more impressive title than your direct supervisor, this may have played a role in your failure to secure an admissions offer. Another possibility, of course, is that your recommenders were unable to effectively convey the information you needed and/or did not do so in the proper manner. Now that the application process is over and decisions have been made, asking your recommenders for a copy of what they submitted is acceptable and could be very illuminating. If your recommender did not convey a genuine understanding of your role at and value to the firm, did not identify you as an elite performer and distinguish you from others, did not communicate in a clearly honest and balanced way, and/or did not provide clear examples to back up any statements of praise, you should consider new recommenders going forward or ensure that your recommenders are better educated about what constitutes a compelling letter. Just because you did not get into a target program, that does not necessarily mean that you applied to the “wrong” school. If you received an invitation to interview, that is at least an indication that your application resonated with the admissions committee and that you were considered a competitive candidate. However, if you applied to several schools and did not get a single request for an interview, you may want to reassess whether the schools you targeted were truly the right fit for you. Take a second look at your target school’s average GPA and GMAT/GRE scores. If your statistics were well below the published figures for your selected programs and you did not get an interview invitation, this may be one indication that you were shooting a little high. Similarly, consider the well-known strengths of the program and the industries into which it sends the majority of its graduates. If your professional needs and goals did not overlap with what the school typically provides, that may be another reason you were not selected to join its student body. In the end, one very feasible possibility persists: perhaps you did not do anything wrong at all. In a situation as competitive as MBA admissions, even candidates who submit very strong applications can find themselves on the outside looking in. So our message is to not be too critical of yourself or your efforts. 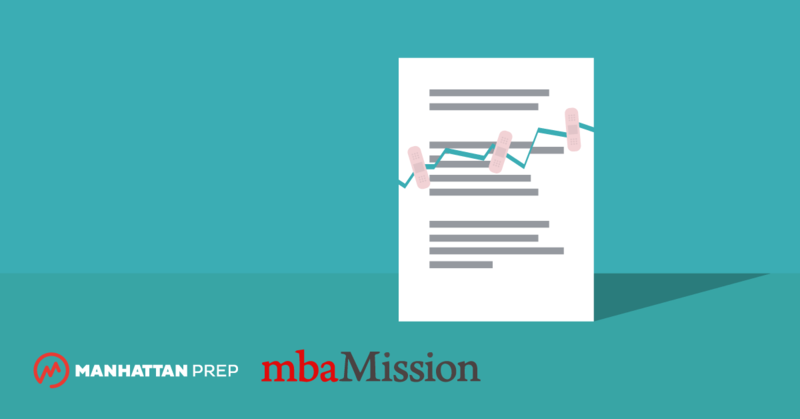 If you are determined to obtain your MBA, you may just need to make some basic adjustments based on where your application may have been less robust than it could have been.